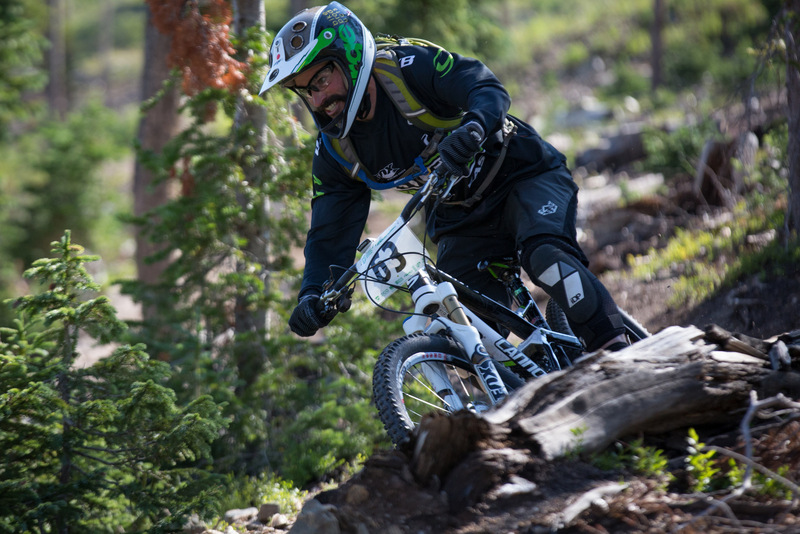 Mtbr participated in the Winter Park Enduro race and got to experience first hand what it’s really like to do a world class enduro race. 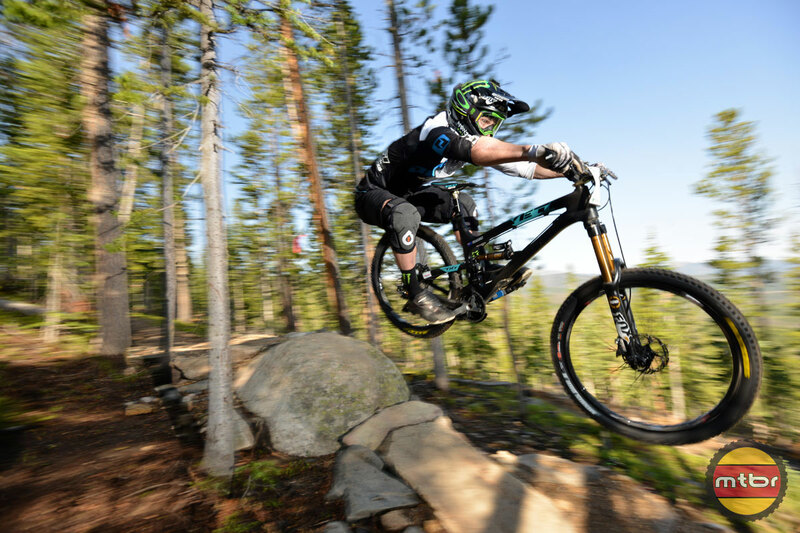 Five stages of some of the best downhill, bike park jumps, cross-country singletrack in the world were on tap for the best racers from 12 countries. The first two Stages were announced in advance but the next three stages were a mystery until about 20 hours before the stage. So riders were able to practice the first two stages as much as they could arriving two days or two weeks prior to the event. But for the next three stages, everyone had a very small window to pre-ride stage 3-5. This equalized folks with varying resources to arrive in Winter Park early to practice. The race was grueling indeed. 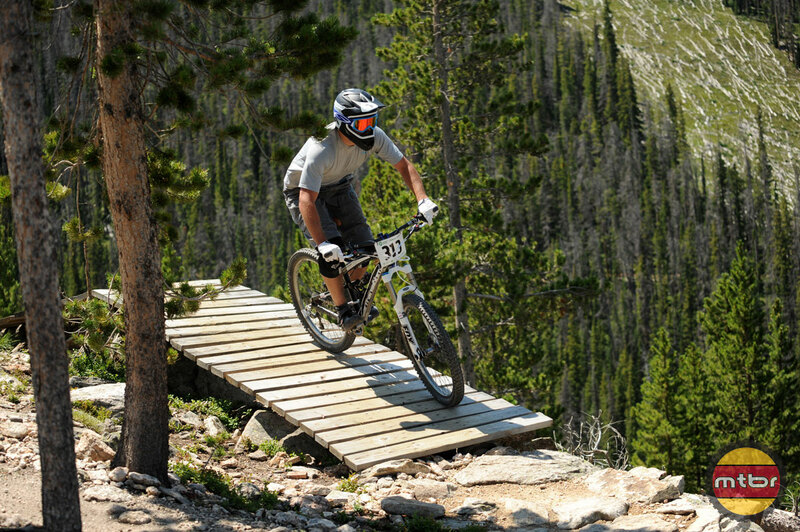 Day one featured the Trestle Downhill run which was a full World Cup level downhill course just a few years ago. And in the afternoon, a run called Rainmaker with 25-foot tabletop jumps dared the riders to air it out. They physical demands of the race displayed itself on Day Two, where riders, still sore from Day One had to do the technical, cross-country trails of Stage 3a and the very tricky 3b which featured drops and huge berms. Then they had to race Stage 4 which featured a lot of pedaling. And as the route for Stage 5 was announced, all the contenders had to pre-ride it. As fate would have it, the lift to access Stage 4 was struck by lightning and deemed inoperable so organizers had to cancel Stage 4. 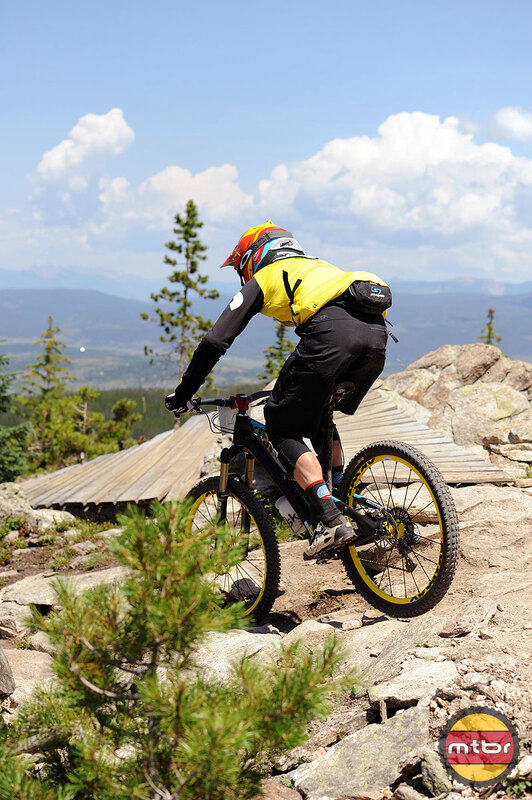 Casual observers may whine about the use of lifts to get to some parts of the mountain but they really have no clue about the physical demands of this race even with use of the lifts. And Jerome has perfect stage racing strategy. He pushes very hard in the first stage or two and he adusts his strategy for the overall win. If he is trailing or he is only ahead by a couple of seconds on the latter stages, he will take all the risks and gain every second. But if he is thirty seconds or higher ahead, then he will throttle it back to ensure he doesn’t crash or get a mechanical. Such is the case this weekend as Jerome got a comfortable lead after the first day. Another noteable performance was put in by Jared Graves of Yeti/Stages Cycling. Jared felt really good going in to the race as he trained hard with a power meter from Stages Cycling and was confident that he had the power and endurance to complement his world class downhill skills. So his stage results read: 1st, 117th, 1st, 2nd, 1st. Note that he absolutely killed the race but his chain went in between his small rear cog and the frame and his rear derailleur snapped. He finished in 20+th place but without the mishap in Stage 2, he would have won or would have really pushed Jerome for the top spot. Aaron Bradford who we’re used to seeing in cyclocross races stunned the field with a 4th place finish. 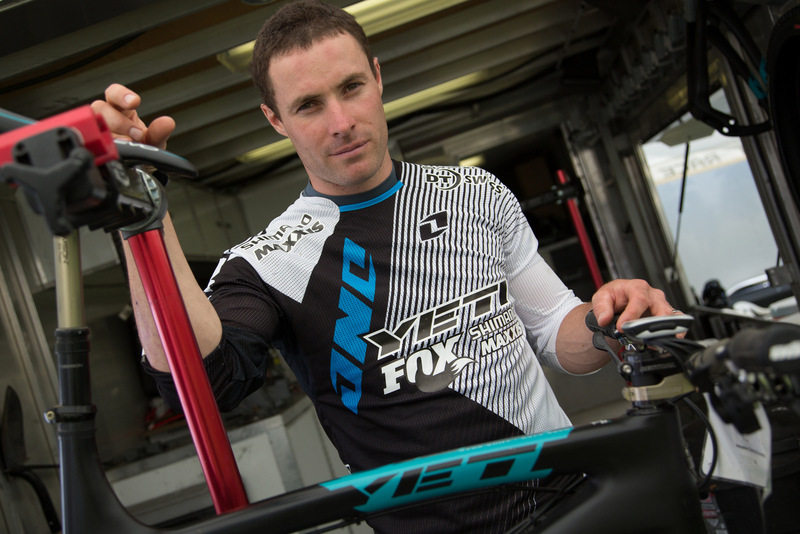 He improved his standing every day and he put in the best finish ever for an American in an Enduro World Series race. 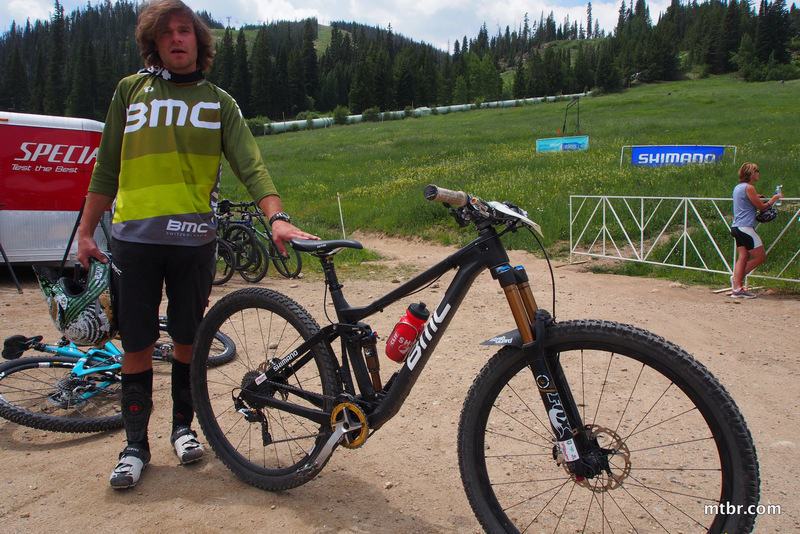 Using a prototype long-travel BMC bike, Aaron said “I just got this bike three days ago and I decided to race with it. It is so agile and capable that it really helped me on Stage 3a where just pedaled through all those roots and rocks.” The bike is not announced yet but we suspect it will be a Trailfox 29er with 140+ mm of travel. 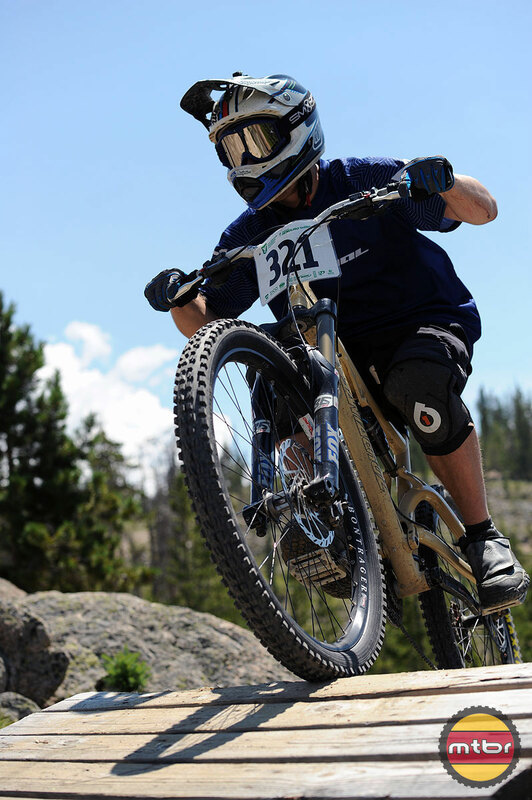 Tracy Moseley of Trek crushed the women’s field once again as she used her 140mm travel Trek Remedy 29. Smooth, plush travel was a real advantage on the downhill course of Stage 1 and the rocky, rooty singletrack of Stage 3a. Clementz solidified his lead in the overall standings with a consistent effort at Winter Park Resort. Bolstered by riding that was both fast and consistent, Frenchman Jerome Clementz (Cannondale-OverMountain) and Brit Tracy Moseley (Trek Factory Racing) pulled off wire-to-wire overall wins at round No. 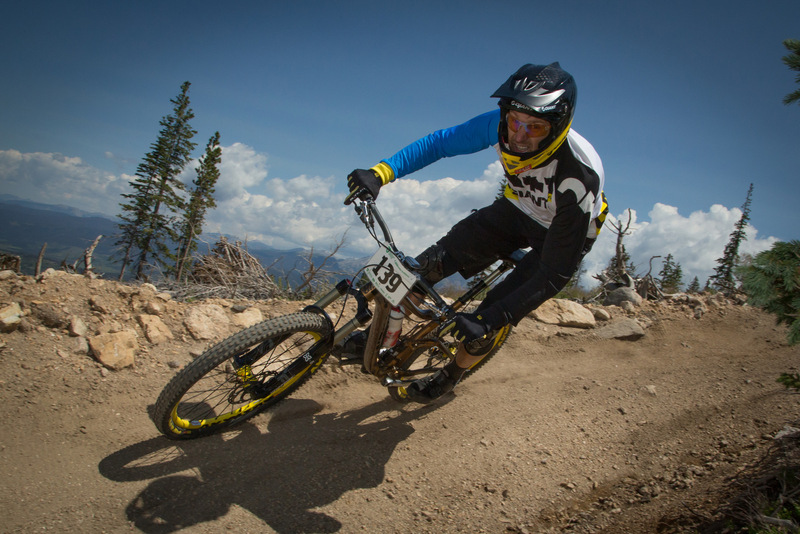 4 of the Enduro World Series at Colorado’s Winter Park Resort this past weekend. 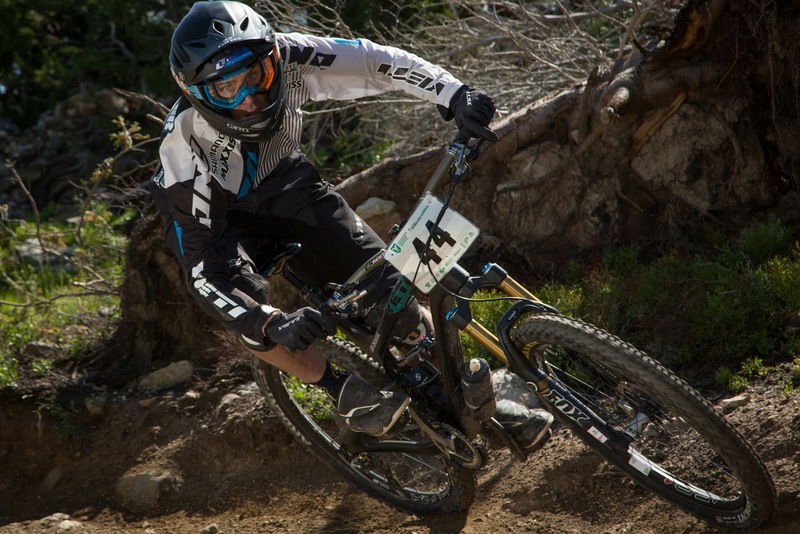 That helped both maintain their overall leads in the seven-race series that next heads to Whistler, British Columbia for the Crankworx round. 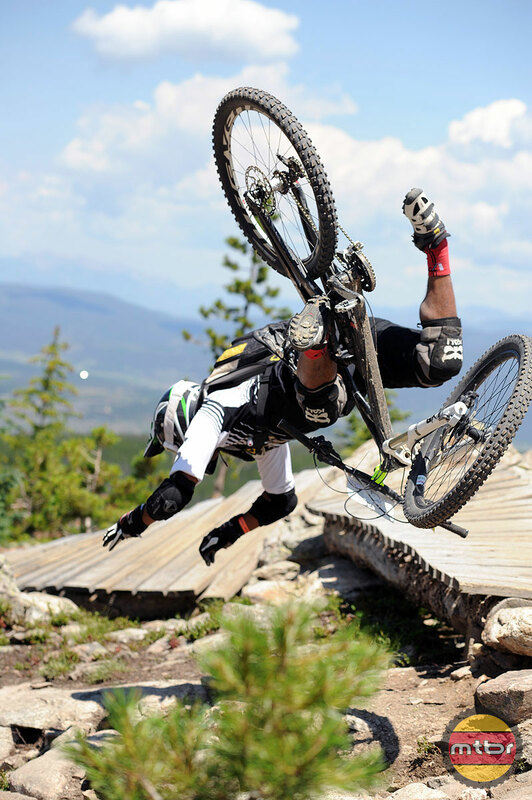 The Enduro World Series wraps up October 19-20 in Finale Ligure, Italy. 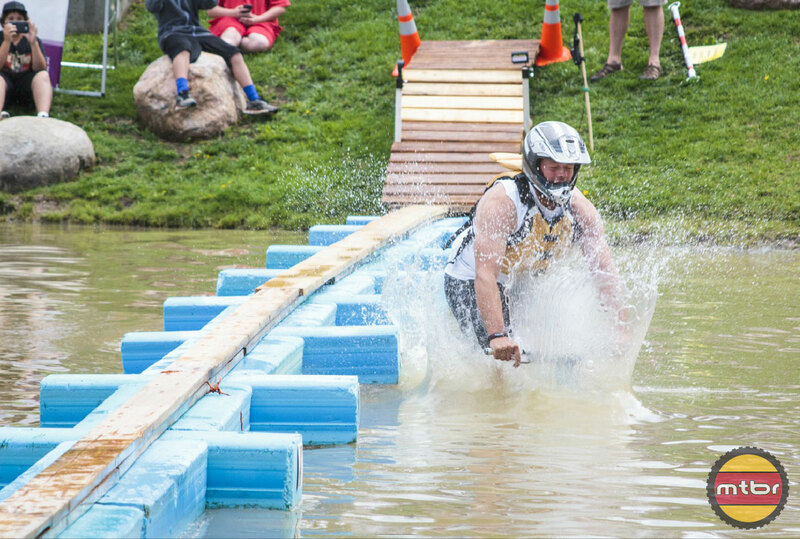 In Colorado, Clementz won just one of the event’s five stages, but was second, third, fourth and ninth on the other four, which helped him score a commanding 37-second overall triumph ahead of second-placed Nicolas Vouilloz (Lapierre). Fabien Barel (Canyon) made it a 1-2-3 sweep for France, slotting third at 0:42. Clementz’s total time was 41:12.455. Vouilloz also won a stage, with the other three going to hard-luck loser Jared Graves (Yeti), who though he finished 25th overall, appeared to be the strongest rider at Winter Park. Problem is the Aussie suffered a major mechanical on stage 2 and lost more than three minutes, putting him far out of contention. Other notables in the final standings included top placed American Aaron Bradford in 4th, former cross-country honch Adam Craig (Giant) in 8th, Mark Weir (Cannondale-OverMountain) 19th; and Jeremy Horgan-Kobelski (Trek Factory Racing) 20th. Trek’s Moseley put on a similarly dominating performance, besting famed Frenchwoman Anne-Caroline Chausson (Ibis) by 39 seconds. Chausson actually won the stage win battle 3-to-2. But just like Clementz, Moseley smoked the long and grueling stage 3, putting more than 38 seconds into her top rival. Anneke Beerten (Specialized) rounded out the top three in the women’s pro standings. Other notables included former XC racer Heather Irmiger (Trek Factory Racing) in sixth, Giant’s Kelli Emmett in eighth, former cross-country national champion Sue Haywood in 15th, and cyclocross specialists Teal Stetson-Lee (Luna) and Julie Krasniak (Velo Vert) in 17th and 22nd respectively. All told 216 riders from 12 countries competed in the five-stage, three-day event. Know what I like about MTBR? 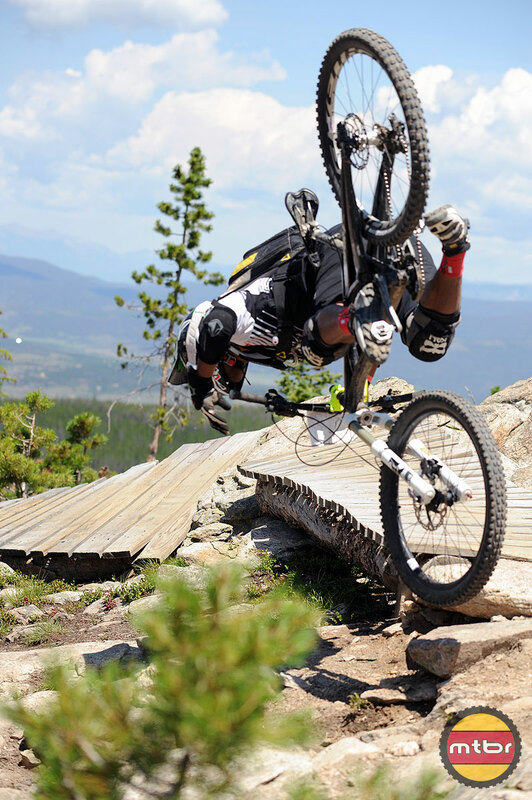 It’s got a paucity of 13-year-old “pros” calling 29er riders fags. How very refreshing, and a welcome change from other color-based websites.